In a medium bowl, combine flours, sugar, baking soda, and salt. In a small, separate bowl, combine honey, oil, and water or milk. Add the liquid ingredients to the flour mixture and stir until dough comes together in a ball. Remove small chunks of the dough and roll it into a ball between your hands. Place each dough ball on a baking sheet lined with parchment paper or greased with cooking spray and flatten it to a circle about 1/4″ thick. Bake for 14-15 minutes, or until edges are slightly crisp. Place marshmallows on a greased baking sheet. In a conventional or toaster oven, broil them at 450 degrees F for about 1.5 minutes. Remove from oven and flip them over. Broil the other side for about 1.5 minutes, keeping a close eye on their color. You can broil them more or less, depending on how toasted you want the marshmallows. 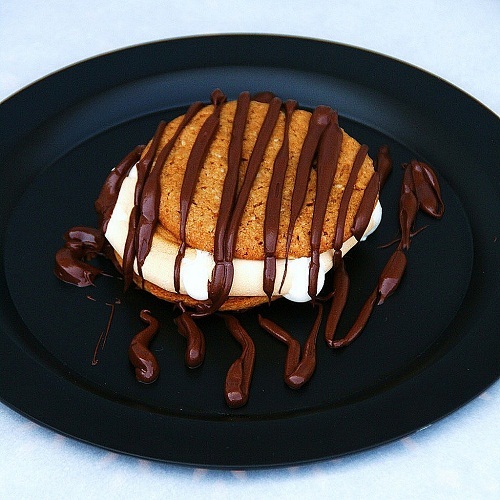 Sandwich each toasted marshmallow between two Graham Cracker Cookies. In a separate microwave-safe bowl, measure out chocolate chips. Microwave on 70% power for 1 minute. Remove and stir. Continue microwaving in 20-second intervals and stirring until chocolate is entirely melted and smooth. Transfer melted chocolate to a Ziploc bag. Cut the end off and drizzle chocolate over sandwiched marshmallows.